We‘ll keep your storage safe even when it’s not moving at all. Keeping your belongings safe and secure is our priority. Our storage facilities feature an electronic tracking system so our staff can effectively manage your inventory, quickly look up the precise location of your goods and provide detailed information about your storage. Our home storage facilities are fully-secured for the utmost protection of your goods. Each facility is outfitted with fire and theft protection systems, camera surveillance and 24-hour security. We operate multiple state-of-the-art warehouses to ensure storing your commercial products within our facilities is convenient and efficient for pickup and delivery. We can also pickup, receive, store and deliver your goods as part of our warehousing and distribution services. 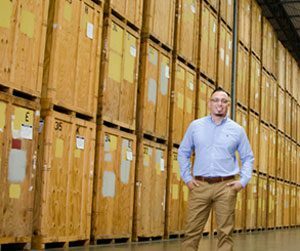 Contact Ward today for details on our full-service storage solutions and capabilities.